VAI is an all Ireland body, which means that Brexit will have a clear impact on us and on all arts organisations across the island who operate either across the border or ROI collaborations with UK organisations, festivals and events. The unfortunate truth is that the fallout from the vote has already happened. The fall in Sterling has had a direct impact on organisations such as ours that receive funding from Northern Ireland. Around 19% of our funding comes from the Arts Council of Northern Ireland and through our membership in Northern Ireland. With the collapse of the Sterling against the Euro this has now been reduced to around 13%. Although we have always operated our NI work programme in a very lean manner so as to take full advantage of our funding, we now face the reality that the percentage of work covered by our administrative staff in the Republic to support our work in the North is in real danger. 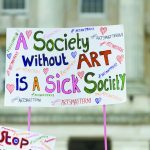 We are faced with the serious choice of whether to split the organisation and reduce our level of administration, therein reducing the services that we can offer to our members, or to find ways to ensure that these costs are covered in order to fully support Northern Ireland’s visual artists. This is happening against a background of potential in-year cuts and serious pressure on the arts in Northern Ireland. Both jobs and key services are in danger. We also have serious concerns about the mobility of artists and of artworks post Brexit. If we go back to having border controls with Northern Ireland then we face increased costs and bureaucracy in moving art across the border. 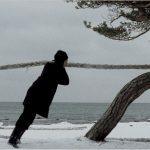 The introduction of costly administrative processes may prevent organisations from touring and sharing artworks and arts initiatives. The same applies to cultural exchange with the rest of the UK. A case has to be made for free movement of culture. According to a report by the Department of Culture, Media and Sport, Ireland is the UK’s third largest market for culture after the US and Switzerland, with a value of £631,000,000. In the short term a weakened Pound may seem appealing but in the long term our cultural relationship will be diminished as it becomes less viable for arts organisations in the UK to work in the Eurozone. Due to its open border with the UK, Ireland is not a member of the Schengen Travel Area. This means that we already work in a complex system and that future EU cross border collaborations may require up to three visas. None of these visas are guaranteed and failure to comply with all three jurisdictions has seen individuals deported. In a recent case, a leading Turkish academic was required to provide so much information for both his Irish and UK visas that he decided to avoid coming to the Republic and Northern Ireland to speak at a conference. This is clear evidence of what the future will look like for more and more people. If the UK moves towards even more stringent controls on freedom of movement and closes its borders to yet more countries, collaborations between the North, the Republic and the rest of the UK will be curtailed. If the UK broadens its visa limitations then organisations in Ireland may have to rethink who they work with – which is a form of censorship – or reconsider their relationship with UK organisations and audiences. Comments on the BBC Radio 4 Front Row special: ‘Brexit: The Cultural Response’ (Tuesday 26 July 2016), which outlined that the benefit of Brexit is that ‘English’ audiences could now enjoy ‘English’ culture, were particularly unhelpful. 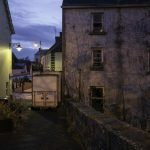 This attitude would damage ongoing projects that have previously been funded by public money to bring culture across the border and into communities where it has had a transformative effect. We should also take into consideration that London is a transit point for culture coming from around the world into Ireland. Organisations ship their work through London and artists from further afield transit through London. It becomes more costly and less attractive to travel here if it means shipping through a non-EU country. Already arts organisations are looking to change their transit point to places within the EU such as Paris. This will have cost implications and will again increase administrative burdens on arts organisations across Ireland. Increased financial pressure is something that we in the arts are hardly able to consider as we try to maintain ourselves after so many years of cuts. Lastly, we shouldn’t forget that London is also one of the great art centres of the world. 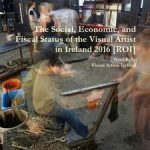 Many Irish artists have moved there to pursue their education and to find work. They depend on various EU supports for education as well as being able to fall back on social welfare and the National Health Service during times of need. In this respect the future is very unclear, as we don’t yet know exactly how Brexit will be implemented. Will we see a trail of artists returning or will they travel even further away as they look to expand their careers and gain experience? There are many more areas that need to be considered when discussing ‘cultural Brexit’ and unfortunately the concerns of the arts community are very far down the list of priorities. But, as stated, Brexit is already impacting us. It would be reassuring to know that our voice is being heard and that there is active engagement with arts organisations so that we can navigate through this growing morass of uncertainty. Noel Kelly, Director/CEO, Visual Artists Ireland. 87Gibraltar is not part of the UK, but it is treated as though it is in respect of the UK’s membership of the EU. 104Q135 [Dan Mulhall]. The NSMC established implementation bodies for food safety, the promotion and development of Lough Foyle and Carlingford Lough, inland waterways, language, trade and business development, and special EU programmes. 116Q824 [Ben Wallace]. “Five Eyes” refers to the intelligence alliance between the UK, Australia, Canada, New Zealand and the USA.